Love Gardening! Issue #21: Pictures Ready? 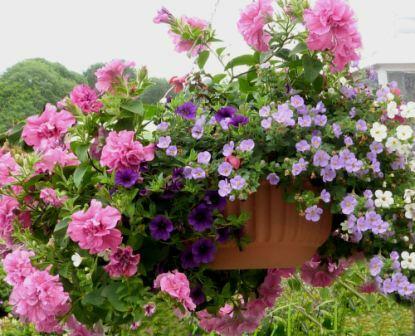 Let's Share Your Hanging Basket Ideas! Pictures Ready? Let's Share Your Hanging Basket Ideas! Remember we talked about getting your hanging basket pictures ready to share? Let's do it. Everything's set up and ready to go. So I'll show you mine if you show me yours! I just love a good hanging basket. All that beauty cascading down. Usually my hanging basket at the front of the house gets as dry as a bone. It's a sun trap out there, and it can be very tricky to keep going throughout the summer season. Miss a morning or evening session and dusty compost and wilting plants abound. The plants in this particular baskets. The type of hanging basket and where to find one. A video on how to plant an easy fill hanging basket. Ideas for winter hanging baskets. 2) Use the form: it's just a title, a place to write about your hanging basket and a place to upload pictures. Either way, you can tell us about the plants in it and why you like the combination, what sort of hanging basket you used (self-watering, easy-fill or standard) and any tips or tricks you'd like to share. Let your ideas flow. You can never write too much! In fact more is better. Upload your pictures directly onto the form, with a bit about your basket here. It's really easy. Don't worry if your writing's a bit higgledy piggledy. I'll take a look and make any necessary adjustments. It's the pictures we'd like to see and the ideas we'd like to hear about! Let's see if we can see some fantastically beautiful hanging baskets from all corners of the world. * How to make a canopy for your pergola. Be sure to check out the new pages and updates here, and the fantastic pergola and garden related offers here. There have been some real corkers recently!